Introduction: Wandering spleen is a rare anatomic anomaly resulting from congenital absence or laxity of the splenic ligaments. We present a case of a wandering spleen causing obstruction of the proximal Roux limb following laparoscopic gastric bypass (LGBP). No previous cases of this anomaly following bariatric surgery were reported. Case report: A 36 year-old female presented with intermittent abdominal pain, nausea, vomiting, increasing weight loss and palpable lower abdominal mass present for 3 months. She underwent a LGBP five years prior to this presentation and had lost 208 Lbs. A diagnosis of wandering spleen localized in a right lower quadrant of the abdomen was made based on a CT scan of the abdomen and barium swallow tests. The spleen was pulling on a gastric remnant, obstructing and twisting the proximal Roux limb. Laparoscopic splenectomy resulted in complete resolution of the patient’s symptoms and 15 Lbs weight gain. 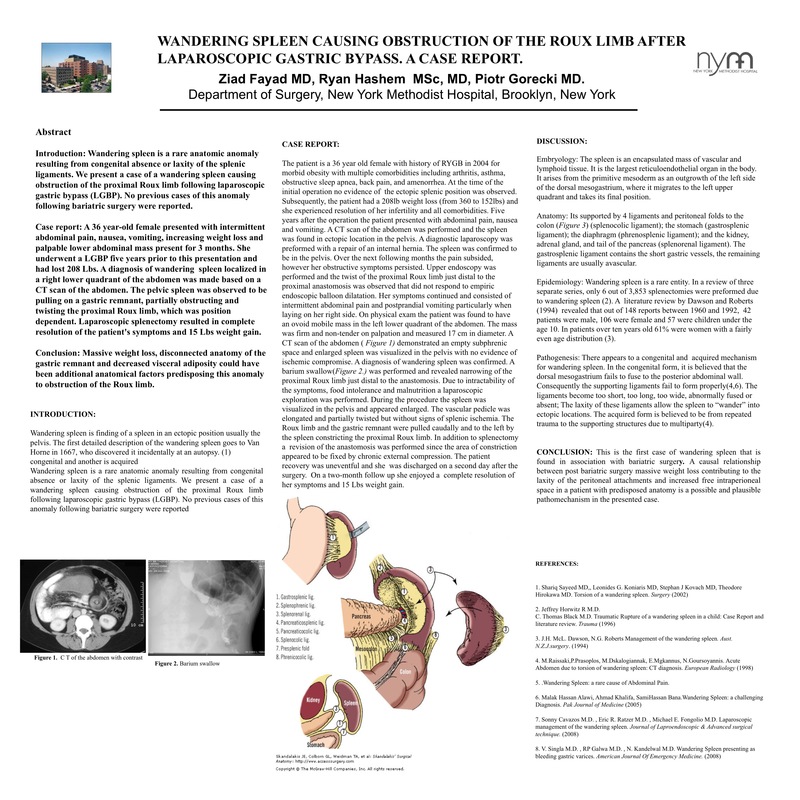 Conclusion: Massive weight loss, disconnected anatomy of the gastric remnant and decreased visceral adiposity could have been additional anatomical factors predisposing this anomaly to obstruction of the Roux limb.